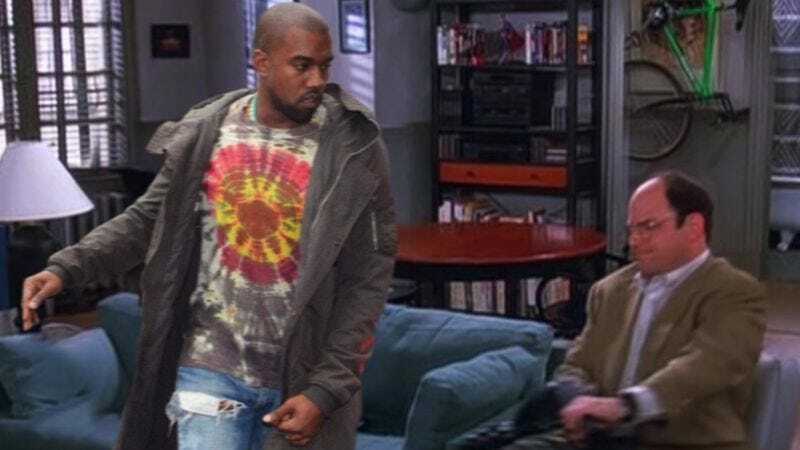 It was only a matter of time before the most self-obsessed rapper of his generation was drawn into the vortex of self-absorption that is Seinfeld. Over the weekend, Kanye West not only made his triumphant return to Saturday Night Live but also debuted his long-delayed, highly anticipated The Life Of Pablo on Tidal. Of the new album’s 18 tracks, easily the most classically West-esque is entitled simply “I Love Kanye” and features the rapper’s own first name a staggering 25 times. (A representative sample: “I miss the sweet Kanye / Chop up the beats Kanye / I gotta say at that time I’d like to meet Kanye.”) West debuted the song during a performance at Madison Square Garden on February 11, then recited the lyrics during a supposed MC battle with Kyle Mooney on SNL a few days later. The song is allegedly West’s self-kidding response to the internet’s stubborn “Kanye Loves Kanye” meme. Naturally, the song is already the subject of parodies. The creator of the Seinfeld2000 Twitter account has cut right to the chase and simply layered West’s vocals over Jonathan Wolff’s bass-heavy Seinfeld theme. The 36-second track originally appeared on Seinfeld2000’s Soundcloud page but was quickly taken down at the behest of Universal Music Group. The mashup has since been resurrected in tweet form and is now available for the world to enjoy. Thematically, it’s a perfect marriage. On Seinfeld, not only did George occasionally refer to himself in the third person (“George is getting upset!”), but there was an entire episode, “The Jimmy” from 1995, about a character with this irritating and confusing habit. Oh, and thanks to Rob Kleckner, there’s a Cheers variant on this, too.